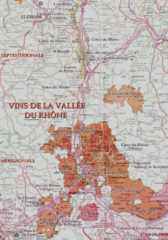 The Rhône wine region is broadly divided into north and south. The north produces Syrah based Reds and pure Viognier Whites. The south produces Châteauneuf-du-Pape and other blends from several varieties. The first cultivated vines were likely planted in 600 BC.